Join Hollywood Mom Blog as we go behind-the-scenes and get the inside scoop on Looking Ahead Awards 2014! Hollywood Mom Judy Swank is recognized for her true effort in raising a well-adjusted, successful actor! Academy-award winner Hilary Swank and her mother Judy Kay Swank were the top honorees at the Looking Ahead Awards held Thursday evening, December 4, 2014 at the beautiful Taglyan Complex in Hollywood. Hilary presented her Hollywood Mom with a much deserved award recognizing her sacrifices and commitment in raising the extremely successful actress. This is major step forward for any Hollywood awards ceremony as parents of child actors almost always go completely unrecognized. 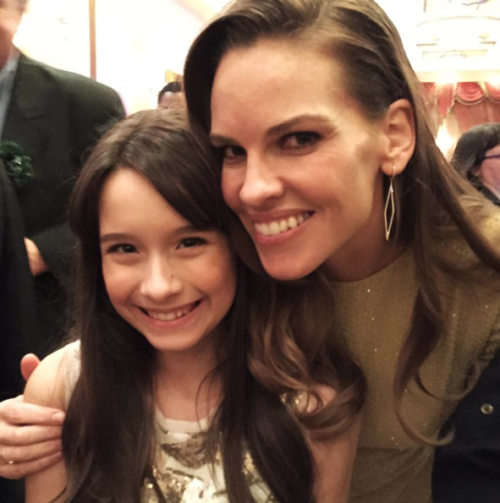 Hilary Swank took time at the event to talk to many Child Actors. Pictured here with Michelle Moores. A special community service award was presented by teen star Hailee Steinfeld (Pitch Perfect 2, True Grit) on behalf of Looking Ahead to former Wonder Years child star and Looking Ahead Advisory Chairperson Fred Savage. 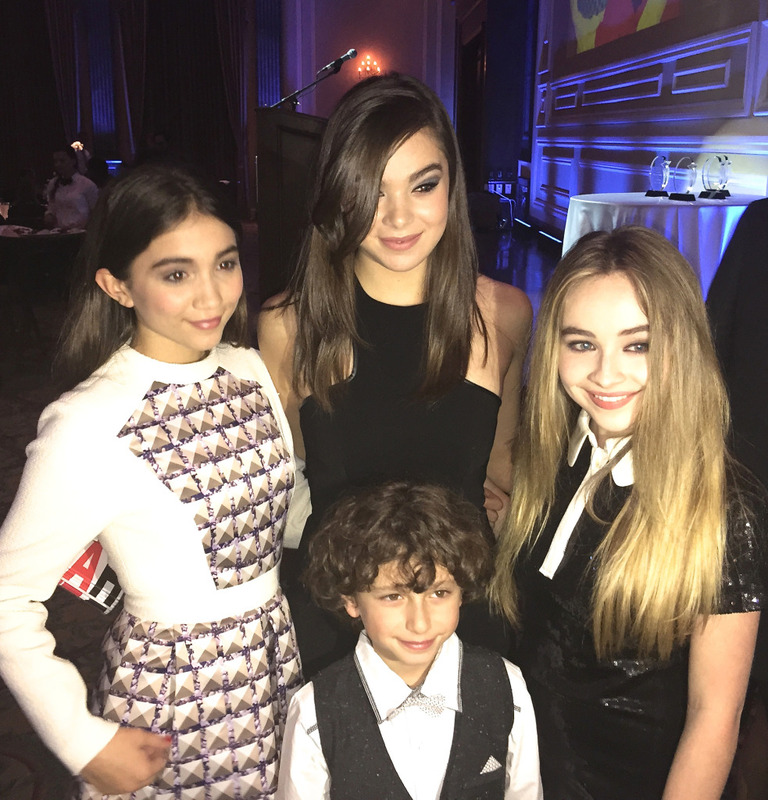 Child Star Hailee Steinfeld, 17, was a special presenter at the Looking Ahead Awards 2014 ceremony. 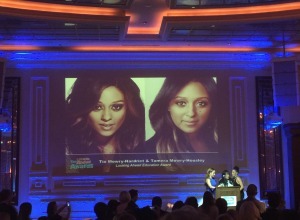 Also honored at the Looking Ahead Awards 2014 were former “Sister Sister” child stars Tia Mowry-Hardrict and Tamera Mowry-Housley. The twins are well known within the industry to be educated, professional and well-adjusted. As HMB as reported in the past, their mother Darlene Mowry worked diligently to make certain they kept up with on set academics and attended college. Kudos to Hollywood Mom Mowry! Former co-star Jackee Harry presented the Mowry Sisters with their Looking Ahead Award. 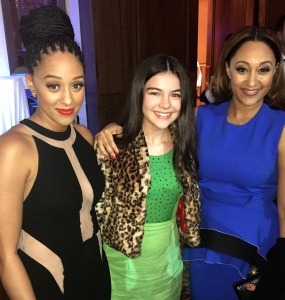 Sisters and former child stars, Tia Mowry-Hardict and Tamera Mowry-Housley greet child star Merit Leighton at the Looking Ahead Awards 2014. Hundreds of Hollywood’s best and brightest child stars (many from the HMB family) and former child stars of all ages came out to celebrate the Looking Ahead honorees and join in in the festivities. 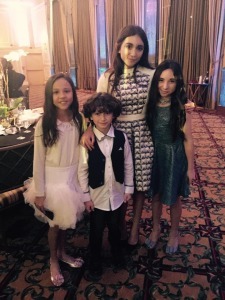 Disney Child Stars Rowan Blanchard, August Maturo, Sabrina Carpenter, Peyton Meyer and Corey Fogelmanis of Girl Meets World were in attendance and caught catching up with old friends Merit Leighton (Sofia the First) and Marlowe Peyton (Parenthood). 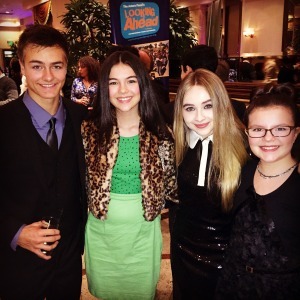 The cast of “Girl Meets World” on the red carpet of the Looking Ahead Awards 2014. Haunted Hathaways’ (Nickelodeon) child stars Breanna Yde and Ava Cantrell, and their friend Michelle Moores had a great time together on the red carpet and catching up with all their friends. 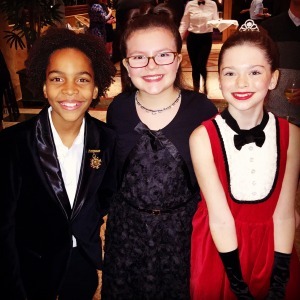 Child actors and siblings Dusan and Dante Brown were joined by fellow actors Garrett Palmer, Tessa Germaine, and Alyssa Freyder (not pictured). Breanna Yde and Ava Cantrell, and their friend Michelle Moores on the red carpet of the Looking Ahead Awards 2014. The awards’ generous benefactors were children’s cable networks Nickelodeon and Disney Channel and Disney XD. Other contributors were the Art Directors Guild (IATSE local 800), the Osbrink Agency, Cynthia Bain’s Young Actor Studio and SAG-AFTRA. So many child stars and celebrities turned out in support of the awards – we know it will only get bigger and better as years go on! “Getting to see Tia and Tamera Mowry was especially cool since I loved “Twitches” but hearing them talk so passionately about education and how it really changed there lives was a great moment. Judy and Hillary Swanks speeches were REALLY fantastic. They spoke of kindness and treating people equally. Saying ‘it’s not a competition,’ I turned to my mom and said …’that’s’ all the stuff you say to me!’ and I hugged her. 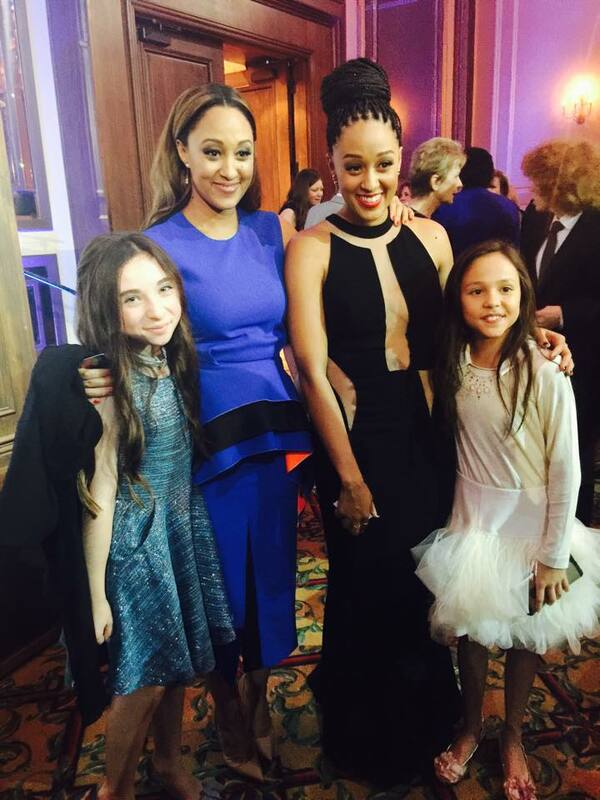 Ava Cantrell with actresses Tamera and Tia Mowry and her “Haunted Hathaways” pal Breanna Yde inside the Looking Ahead Awards! “As a young actress, it is very inspiring to see successful people that started as young actors and actresses pave the way. I was so moved to hear Margaret O’Brien speak. My first monologue to find a theatrical agent was to The Canterville Ghost. Margaret OBrien is one of the most outstanding and influential actors of our time. When Hilary Swank spoke about the trials and tribulations of this business and gave her mother an award, it brought me to tears. Fred Savage made me laugh. I can so relate to being the “weird acting kid,” he referred to himself as. Charity is very near and dear to my heart and giving back. When I learned more about the Looking Ahead Program I knew it was the right place for me to be. The venue was beautiful, food delicious, and company was amazing. So happy I attended the Looking Ahead Awards! Actress Marlowe Peyton (center) with friends Terrell Ransom Jr. and Eve Moon. Other supporter’s include Fred Savage, The Williams Family (Angela Williams, Tyler James Williams, Tyrel Jackson Williams and Tylen Jacob Williams), Darby Hinton, Sharon Lieblein and Nancy Wileman. 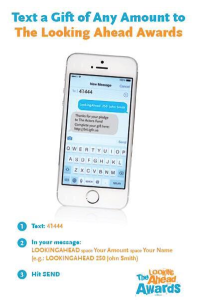 One of HMB’s favorite elements of the Looking Ahead awards ceremony were the text donations campaign which Hollywood Mom Blog encouraged everyone to participate in via Twitter @HollywoodMom. HMB sent out 30 tweets which were favorited and retweeted by all our dedicated HMB family and some celebrities (we’re looking at you Rowan Blanchard!) and amazing corporations (Thank you First Entertainment Credit Union). By the end of the evening we Received a whopping 180 retweets and numerous favorites! THANK YOU ALL FOR YOUR SUPPORT! *Thank you to Hollywood Moms Suzette Troche Stapp and Janina Cantrell for contributing their photos. The Actors Fund’s Looking Ahead program was created in 2003 in partnership with SAG-AFTRA to work with youth between the ages of 9 and 18, helping them develop the values, skills and confidence they need to make successful transitions to fulfilling adult lives. Visit www.lookingaheadprogram.org. The Actors Fund is a national human services organization that helps everyone – performers and those behind the scenes – who works in performing arts and entertainment, helping more than 17,000 people directly each year, and hundreds of thousands online. Serving professionals in film, theatre, television, music, opera, radio and dance, The Fund’s programs include social services and emergency financial assistance, health care and insurance counseling, housing, and employment and training services. With offices in New York, Los Angeles and Chicago, The Actors Fund has – for nearly 132 years – been a safety net for those in need, crisis or transition. Visit www.actorsfund.org.